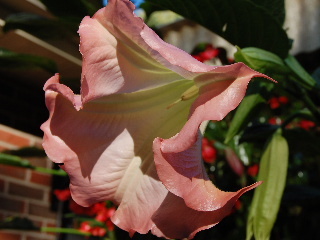 The Angel’s Trumpet (Brugmansia) is a tree-like shrub that produces large beautiful trumpet-shaped blooms. Angel’s Trumpet (or Angel Trumpet—the names are used interchangeably) is native to South America, where it grows in its natural flowering shrub form and often reaches heights up to 20 feet and more. The plant is often mistakenly referred to as a tree because, as it grows and matures, the stems develop a grayish bark-looking exterior that causes the Angel Trumpet to take on more of the appearance of a small tree rather than that of a shrub. 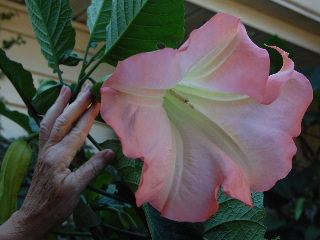 The enormous blooms, which are the main reason for the plant being cultivated in the home garden, occur in a variety of colors from white to orange to yellow to shades of pink and red. In addition to the beauty of the colors, the flowers of the Angel Trumpet are also very fragrant, adding to the plant's appeal as a desirable addition to the home and patio garden. The plant can be started from seeds or by means of cuttings placed in water until roots start to develop before transferring to a soil-filled container. If you do choose to grow your Angel Trumpet plant in a container for the patio rather than planting directly into the garden, be sure you use a sufficiently large pot as the Angel Trumpet will grow very quickly to a large size and require plenty of room for its roots to expand and feed. Also, set the pot in an open and sunny location on your deck or patio to allow adequate space for top growth and spread. The Angel Trumpet is a perennial. It can be cut back to a low height late in the year and brought into the garage or basement, where it is allowed to over-winter in a largely dormant state, before being brought back outdoors the following spring to begin another growing and flowering season. Be sure the plant is rooted in nutrient-rich soil, and water and feed the plant on a regular basis as the spring growth begins. The plant will grow rapidly and produce many blooms if fed and tended properly. Prune into desired shape as the shrub grows; pruning stimulates growth and encourages the production of those giant blossoms. The Angel Trumpet is a member of the Nightshade family of plants that includes tomatoes, potatoes, and eggplant. All of the flowers and fruits of this family have at least a low level of toxicity; in this way, the plants protect themselves from insects and other potentially damaging pests. However, not only are the flowers of the Angel Trumpet toxic, the entire plant is actually toxic, and it is recommended that gardeners wear gloves when dealing with this plant. Care should also be exercised if small children or pets are expected to be in close proximity to the Angel Trumpet, so that they not unsuspectingly ingest any part of this plant. The history of this plant ascribes to it hallucinogenic powers, and a number of deaths have been caused from those ingesting the plant (especially the blossoms) as a tea while seeking a “high.” It has sometimes even been referred to as the Angel’s Trumpet of Death. Enjoy the plant for its beautiful and fragrant blossoms, but be cautious.